In just under seven months war veteran Duncan Slater joined Walking with the Wounded as the first double amputee veteran to race to the South Pole and achieve it. Inspired by stories of previous expeditions which have included the North Pole and Everest, Duncan made the British team’s final six from over 300 applicants. After working with an injured serviceman the team at Motion were keen to learn more about his remarkable journey and the inspiration behind it. 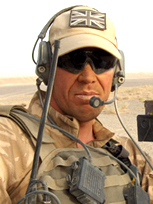 After joining the RAF aged 19, Duncan enjoyed a range of posts across the military. Dedicating his life to the R.A.F. for over a decade, Duncan was parachute qualified and worked mainly with airborne units. In 2009 Duncan was on patrol in an area called Babaji during operation ‘Panthers Claw’ when an Improvised Explosive Device (I.E.D.) hit Duncan’s vehicle. Duncan was thrown forty feet by the impact and suffered breakages to his legs, ankles, ribs, lower back, shoulder blade and left arm. The only unbroken part of his body was his right arm. He was evacuated to Camp Bastion before moving to Selly Oak Hospital in Birmingham and Headley Court in Surrey. After 12 months of rehab it became clear that both legs must be amputated in order for Duncan to be able to walk pain free. After being injured in Afghanistan, Duncan is determined to prove naysayers wrong and show that limitations are only in the mind. He also hopes to give inspiration to others in similar situations. Duncan cycled Lands End to John o Groats in May 2011, 8 months after he was amputated completing 1000 miles in 10 days. The South Pole 2013 he is only double amputee ever to make it to the south pole and entered in the Guinness Book of World Records. Duncan was due to run the London Marathon in April 2015 but due to back injury will be patiently getting back to 100% injury free. 2016 brought new challenges and in April Duncan faced his biggest challenge yet, the gruelling Marathon des Sables which consists of six marathons in six days across the Sahara desert covering 250m. In 2016 Duncan made his first attempt and was the first double leg amputee to take part, he made it to Day 4 when, due to significant damange to his legs, Duncan had to withdraw from the race. In the past year, Duncan has worked with some ground breaking new prosthetics experts to improve performance and chances of completing. Duncan completed the "toughest race on Earth" in April 2017, making history as the first double amputee to complete the 250km journey -the equivelant of 6 marathons- across the Sahara Desert, alongside Chris Moore. Amazing television coverage thanks to ITN. Duncan Slater is an extraordinary individual and for many, many reasons and not least because he filled the ‘keynote speaker’ slot with less than 24 hours’ notice! The original speaker who was due to fly in from another country unfortunately was involved in a car accident and Duncan became the conference hero and keynote! Firstly, for any speaker to fill a huge slot at a conference of 160 international PAs with the amount of notice he had is no mean feat, but boy he pull it off and has now won his own ‘army’ of fans – Personal and Executive Assistants from across the world. Duncan’s presentation is a powerful story of overcoming adversity, teamwork, humidity, compassion and sense of self. He presented with humour and grace and I fail to see how anyone could not find this story of huge inspiration.